If you're inclined to meet someone for coffee in Toronto, whether romantically or just to catch up with a friend or two, your options are fairly undifferentiated. However, thanks to the Gardiner Museum, Partners in Art, and Illy Coffee - and Yoko Ono, of course - the coolest place right now to grab a coffee in Toronto is at Yoko Ono's Gardiner Museum exhibition, The Riverbed. 1. You've probably never had coffee as part of an art installation before. Why are they doing this? The 85 year-old Yoko Ono is profoundly committed to peace and love. The Riverbed is about healing, mending, and the small gestures people can do. Encouraging you to slow down and enjoy a cup of coffee allows visitors to reconnect and form unions with each other. 2. You are a participant in the art. Collaboration is a major theme in Yoko Ono's art. 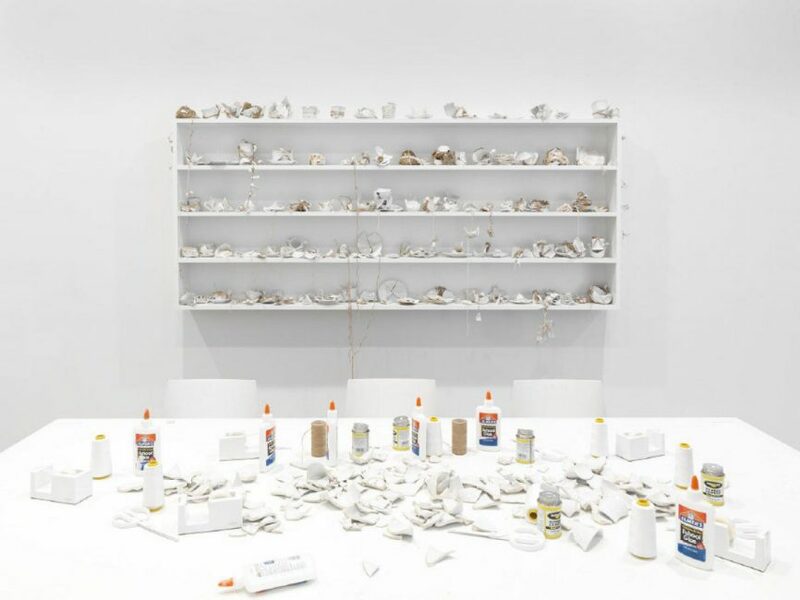 It's the process of creation, rather than the end product, that fascinates Yoko Ono. Seating for the coffee bar is at "Mend Piece": a table covered with broken crockery, scissors, glue, tape, and various forms of string. You participate in the art by assembling your own creations out of these materials, then place it on the shelves to join the ever-growing collection of others' mended pieces. 3. You can put holes in the wall. Try hammering nails into your local Starbucks' walls and see how well that goes over. 4. It's actually quite meditative. The other part of the exhibition is Stone Piece. Comprising 3 tonnes of river rocks imported from Colorado and shaped to look like a riverbed by Founding Curator Meredith Chilton, Stone Pieces invites you to choose a stone, pick it up, hold it, and release your anger and frustration into the stone. 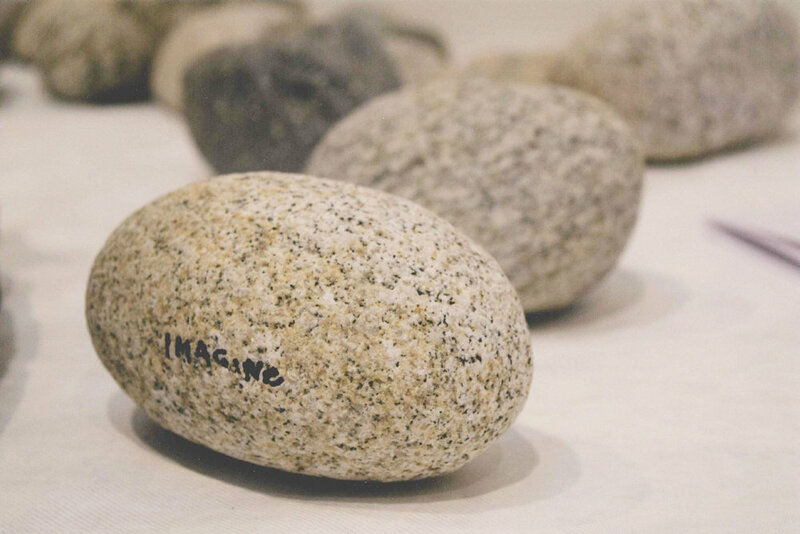 About 20 of the rocks have Yoko Ono's hand-written inspirations, such as "Wish", "Forgive", or "Imagine". Meredith relayed the story of a woman who had come to exhibition on its opening day. Her previous year had been difficult, rife with medical issues. She randomly selected a stone; it had the word "Heal" on it. She sat quietly for 10 minutes, holding the stone, and was profoundly affected. Even if you're not a coffee drinker, The Riverbed at Toronto's Gardiner Museum is a great opportunity to participate in a different, positive, evolving and energizing experience with a friend, family, or even on your own. The Riverbed runs until June 3, 2018. The program also includes a number of film presentations and IMAGINEPEACE Forum moderated by international relations expert Janice Stein. P.S. And those river rocks? Being donated to a landscape artist after the show is over, so they will forever be a part of Toronto.